Register today to win your honeymoon! All brides who pre-register are eligible to win a 2-Night resort vacation packed with sports, recreation, relaxation, dining and so much more! Scroll down to pre-gister or click on this registration link. Come and meet the best of the best at this invitation only Bridal Experience. Mix and mingle with the premier wedding vendors on Florida's gulf coast while being treated to a VIP experience. We will welcome you with a glass of complimentary champagne and concierge wedding planners courtesy of Jennifer Matteo Event Planning. 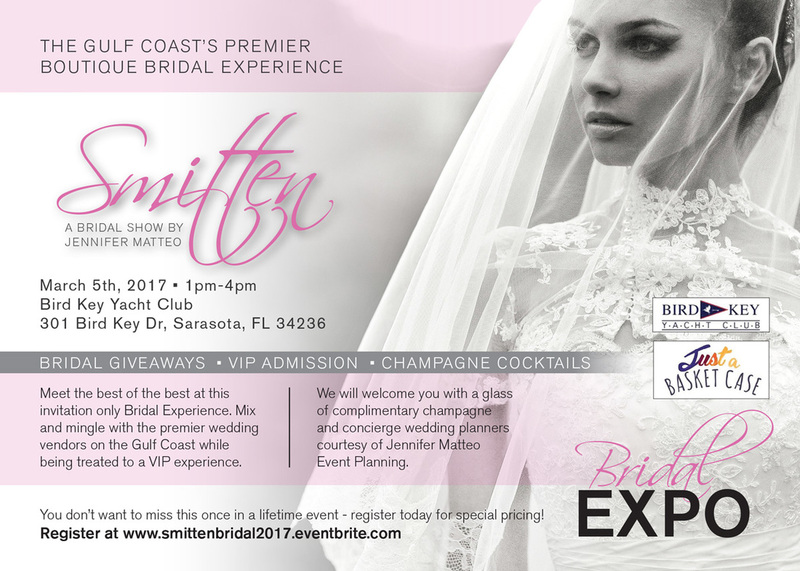 You don’t want to miss this once in a lifetime Wedding Expo & Bridal Show event at The Bird Key Yacht Club in Sarasota, Florida. Anna Coates, Founder of Marry Me Tampa Bay and wedding guru will be in attendance and speaking to the brides about tips, tricks and how to keep their sanity during the planning process! Sit down with Anna and discuss her thoughts on planning and “How to’s” to make your wedding day one to remember! I believe that every wedding or special event is a unique experience for both my clients and the guests in attendance. Everyone dreams of their wedding day, and it is my job to make your dreams a reality while keeping your budget and sanity in tact! With over a decade of experience in the industry, allow me to use my knowledge and connections with area professionals who are the best in the business to make your wedding day stand apart from the rest. It is my pleasure to take the stress out of your wedding so you can enjoy the fun stuff - cake tasting, dress shopping and obsessing over all the little details that we can work on together to make your wedding perfectly personalized! Exquisite. Delicate. Packed with intense taste--yet delicately crispy. All six varieties of Mia Bella Fine Italian Almond Cookies share the same wonderful qualities. Handmade from an artful combination of gluten-free almond flour, egg whites, sugar and natural fruit. It's that simple. Ron from Cakes by Ron is the gulf coasts premier wedding cake designer. Ron Zammit has owned the custom cake shop for over 30 years, and every day Cakes by Ron produces unique cake creations for every occasion. Let Ron and his team make your special day just a little sweeter! Rocio is a sugar artist, baker, and owner of Wonder Cake Creations, a custom bakery in Sarasota, Florida. Rocio’s cakes reflect her affinity for clean simple design, vibrant color and artistic flair, a cake that is a work of art from the inside out. Whether you embrace tradition or if a modern look appeals to you, we deliver impeccable elegance inspired by the theme chosen by you, our most important client. From loose windswept curls to very intricate and precise updos, our stylists will consult with you to create a custom look to compliment your wedding affair. Our makeup artists achieve complexion perfection and long lasting beauty by offering hand applied or airbrushed makeup. To them, it’s an aisle. To us, it’s a runway. We're a premiere beauty destination and our expert dolls will deliver pure perfection everytime! We tailor to you beauty treatments specifically for you. We have thought of everything to make you as comfortable as possible, so you can relax while you get pampered! Our professionalism and expertise will give you a sense of comfort and will make your visit with us a pleasant experience with all the attention to detail that makes Dollhouse Beauty Lounge a special beauty salon. You are unique and your wedding day is a once in a lifetime event. Therefore we customize our hair and make up services to fit your needs. We do not have set prices and ask that you call for pricing. A Victorian bride hair and make up design team celebrate the unions of all couples regardless of orientation. I am a hairstylist and makeup artist that goes on location for events, weddings, photoshoots, and production. I also have a wonderful team for larger parties. At PAINT Nail Bar we believe that getting your nails done should be downright lovely and affordable. Our goal is to provide every client with friendly, impeccable service in a fume-free and luxurious environment. Let our talented nail technicians, high-end polish lines, environmentally friendly products and strict sanitation guidelines spoil you rotten. Beauty By Iveta offers Professional Bridal Makeup and Hair Services on location or in studio. Beauty By Iveta is a favorite among the brides that are looking for more than just the classic traditional makeup application and hair styling. At Beauty By Iveta each bride is offered a customized facial with enzyme peel before the wedding day or super hydrating collagen mask at the day of the wedding before the makeup application. Healthy, flawless skin is essential to a beautiful looking makeup. Natural, freshed-faced and never overdone is what you will get at Beauty By Iveta. A full service bridal salon that offers a comfortable and elegant environment for you to find the perfect wedding dress of your dreams. We are proud to be Manatee County's newest Bridal Boutique, located at Regatta Pointe Marina. At Tie the Knot Boutique, it is our goal to make your dress shopping experience unique, intimate & unforgettable. We offer a selection of wedding dresses that are not available elsewhere in Sarasota or Manatee County. If you enjoy shopping at an intimate boutique, surrounded by beautiful boats and water, we're sure you'll be happy working with us. Tasa has been an artist since the very beginning! Whether she's got her hands on one craft project or into another, she's always enjoyed being overall creative. Tasa began studying silversmith & jewelry design in her home town of Woodstock, NY, and then extensively at the University of New Mexico. Through her small business, called TasaDesigns™, she handmakes jewelry, accessories, bridal pieces, gifts, baby accessories, & home decor in her private studio in Sarasota, FL. Unique, one-of-a-kind, & custom designs is what customers admire most about her work. Something Blue Bridal offers the latest in wedding, prom & special event attire. We serve Bradenton, Sarasota, St. Petersburg, Tampa & beyond. We pride ourselves in providing impeccable customer service in a fun & relaxed environment, without high-pressure sales tactics. We truly believe that finding the perfect outfit for a special event should be easy, enjoyable & memorable. We are a sustainable luxury brand of resort and loungewear designed by Karen Roth and produced by female artisans right here in Sarasota. I specialize in working one-on-one with my clients as my honored guest and promise to give you my full attention and outstanding customer service when you make an appointment with me. I truly LOVE the personal interaction with each of my guests and look forward to meeting you. At Morton’s Gourmet Market and Catering, we partner with our clients to construct custom events that reflect their personal needs and tastes. We concentrate on the smallest details, making every party we undertake a very special memory, that will last a lifetime. CREATIVE CUISINE. SUPERIOR SERVICE. UNFORGETTABLE EXPERIENCES. Puff ‘n Stuff Catering & Events has built an unsurpassed reputation for service and quality in Florida’s West Coast. From your bridal shower, to your wedding reception we can provide all of your catering needs with elegance, creativity and style. Planning a lunch meeting or hosting a dinner party? Bring some bold Mod Med flavors to your next event with Carmel Kitchen Catering. Contact our local coordinators to help you select from our extensive new Catering Menu. At Palacios Events, we take the event off your shoulders but never out of your hands. It starts with our complimentary consultation, were we get to know your personal story, style and vision for your event. While combining conscientious planning with flawless attention to details and collaboration with you; we bring your fairytale to life. Our goal is to ensure that you are stress free and enjoying the day surrounded by those you love. Breezin’ Entertainment is a full service entertainment agency offering extensive options for your wedding, rehearsal dinner, bridal shower & bachelorette party! As a one stop shop for all of your entertainment needs, Breezin’ can provide an array of acts including DJs, bands, soloists, photo booths, cigar rollers, interactive performers & more! By assisting you to find just the right entertainment, coordinating, and making sure the logistics are in place to run a smooth event, we will make your wedding a breeze. Our goal is to create the memorable experience you envision through our entertainment! Have you ever thought about enhancing your next event with live music? I am extremely accommodating and can cater to your every need. Be it Mozart in the morning, or Sinatra after dark, I have the right music for you! I am a Violinist/Soloist for the Asolo Repertory Theatre and the Venice Symphony. I also have performed with The Pops Orchestra of Sarasota, Southwest Florida Symphony, and Florida Gulf Coast Symphony Orchestras. I have played for National and International Music Festivals and have toured Florida with prominent artists like Johnny Mathis, Mannheim Steamroller, Celtic Woman, and The Irish Tenors. North America’s largest and most successful special event service, Complete has been starting parties, telling unique wedding stories and bringing people together since 1973. In fact, we’ve helped plan and execute more than 300,000 events, including more than 13,000 weddings a year.We stay ahead of the tech curve, and we train our staff to uphold the highest standards of professionalism and quality work at an affordable price. When you want expert photos, high-definition video and a gorgeous soundtrack, you need professionals who are passionate about creating things that last. I started DJing over 10 years ago because I love to make people feel good and have a great time. Every event is catered to each couple's needs as far as lighting, emcee and sound. I'm also willing to work with couple's budgets. I will travel anywhere for events. On your first lesson, you’ll learn the basic elements on which all dance patterns are based. In just a short amount of time, our qualified instructors can help you learn a few basic steps or, if you have more time, choreograph the whole dance for you. Whether you want just a few steps to get by or You-Tube worthy choreographed dances for the entire wedding party, we’re here for you! This is also a great way to have fun and relax, before and after the Big Day. Enjoying time together while learning how to dance is a great hobby for any couple to share. Your first dance is such an everlasting expression of love and commitment. So come to Fred Astaire Franchised Dance Studios and give everyone at your wedding a dance to remember. JustaBasketCase Events covers the whole shebang from Weddings & Events, Tablescapes & Party Favors, GiftBaskets/Gift Boxes as well as Rentals. We are your TRUE one stop shoppe in no need to go anyother place! We are also a small venue with a new Baby care line coming out! Oh Darling Events is an In-House Floral Design Studio based in Sarasota, Florida. We work very closely with all of our couples, from conception to creation. We take pride in our personalized approach to business. Each couple has their own unique style and it is our heart's desire to bring your floral design vision to life on your special day. Our goal is to create stunning floral arrangements that will transform your venue, and highlight your dress and decor." The American Shave Shops Created in 2012, are one of a kind; a masculine one-stop shop created to provide men with the finest shaving products and accessories. Our stores are operated by a team of knowledgeable specialists who offer advice to customers on products and proper grooming techniques. Our Barber Shop & Spa offers men the ultimate grooming experience in a masculine and luxurious environment. It is the perfect way to experience the best in men's grooming. Our Master Barbers and Spa Professionals are expertly trained to provide a range of services that will leave clients well-groomed and relaxed. Join the society to achieve the ultimate grooming experience. Deal with the cruise experts to find and book your next dream getaway for less. Situated adjacent to the beautiful Sarasota Bay, The Hotel Indigo Sarasota is an award –winning property in Downtown Sarasota. With a romantic atmosphere and tropical décor, we are the hotel of choice for happy couples and their wedding guests. Our casual elegant design aesthetic and intimate boutique setting, coupled with unparalleled service make us the perfect place to celebrate your big day. Hello Gorgeous Photobooth provides a modern day photobooth experience with elegance and sophistication. Our professional camera, gorgeous lighting and lightning speed printer completed in our sleek and luxurious photobooth, will provide your guests with memories that last a lifetime. Some moments are meant to last forever. Come meet Alexi and Shane - award winning husband and wife photography team with 10 years of experience. Love and Style Photography is an experienced, husband and wife team specializing in Florida and destination wedding photography. We are dedicated to providing you with stunning images, while seamlessly fitting into your wedding day. We want to get to know you and your wedding to capture your unique love and personal style while delivering exceptional service from start to finish. A successful event at the Bird Key Yacht Club offers detailed planning and careful execution. The club will coordinate the elements of your special affair. Once the final arrangements are in place, the Executive Chef will assist with menu planning to insure we meet the needs of you and your guests with amazing cuisine and exquisite service. The experienced staff at Bird Key Yacht Club is prepared to make any event a reality and every wish a spectacular memory. The ambiance of the ranch beckons back to a past era where life was simple, the land was part of your daily life, families were tight, and things were made to last. We have created a 5,400 square foot venue with a laid back atmosphere with that little touch of Southern charm. 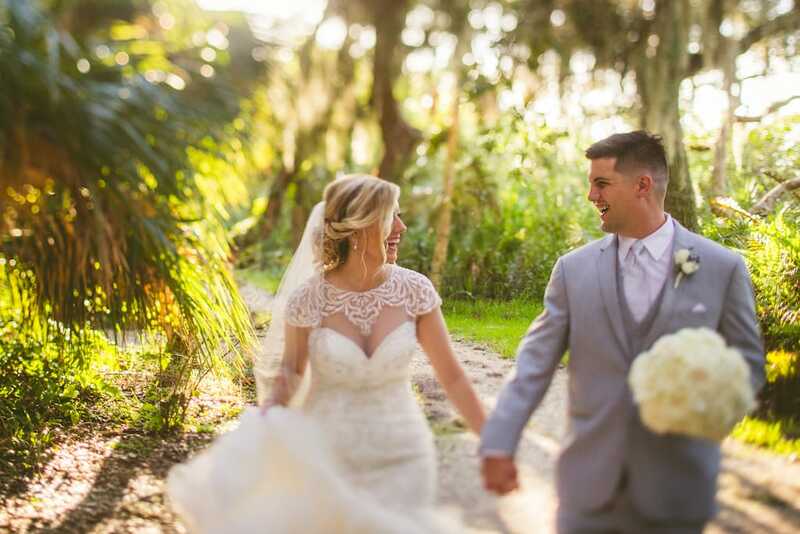 With our captivating Florida ranch views, Old Florida charm and enchanting lighting, the Rafter J Ranch Barn will set the mood for a very romantic wedding and memorable reception. ​The Meadows Country Club is set in a beautiful serene area of Sarasota, Florida. Our Regency Ballroom, located on the second floor of the clubhouse, is the ideal setting for a wedding and can easily hold up to 220 guests. The ballroom overlooks our lush, green golf courses and pond fountains, which is the perfect location for stunning wedding photography. Here at The Meadows, we offer several gorgeous outside and inside facilities for your ceremony, cocktail hour, and wedding entertaining. We have a lovely room on the 1st floor, with incredible views of the putting green that is great for smaller gatherings including a rehearsal dinner, bridal shower, or an after-wedding brunch. Our professional staff is both attentive and detail orientated, ensuring that your special day will be one to cherish forever. Come and see us. We have a true love of creating the most perfect weddings, whether traditional, casual, or black-tie. If you dream it, we can make it come to life! STUDIO 32 is centrally located in Sarasota, FL, and addresses all needs — business, entertainment, and retail — to make your next happening as original as the concept itself. Ideal for, but not limited to: product launch parties, corporate events, wedding receptions, bar mitzvahs, gamer competitions, press previews, and anniversary parties.